After having a rough idea of what I was going to do, I spent a while making the PCB, quite a difficult one, was able to do it with just 2 layers. I also included small pads for the CPLD which I would use pogo pins on. The first revision of the boards arrived so I soldered the CPLD and flash chip then got to work on the CPLD code. I won’t go through all revisions of the code I tried as there were many ways I tried to re-write the same code, it did work to some degree. Most of the time I could read/write to the flash cart and on the GBA see the Nintendo logo but then got a white screen. I found that in order for the Nintendo logo to display, they didn’t use RD to increment the address. But after the logo they started using RD incrementing which is why my code wasn’t working on the CPLD I chose (this CPLD seems to have some problems without a clock). Eventually I decided that I would stick a 50MHz clock on the CPLD and that’s when things started to work better. After a few code changes I was seeing the screen after the GBA but writing to the cart was sometimes glitchy, it would stop writing at certain addresses. After a bit of research I found that when using clocks, you have to synchronise the inputs by using 2 flip flops which solved the problem. After playing around a bit more, I was using the reset pin to reset some of the registers back to defaults when it booted up and soon realised that I didn’t need to worry about any of that. Here’s the final code I have, every clock cycle we sync the CE, RD and WR inputs. When the address is placed on the bus and CE goes low, we latch the address as long as the address hasn’t already been latched and we set our lower 16 bit output address of the flash chip to be the lower 16 bit input address. If the address is latched and then RD goes low, we set a variable to addressIncrement to 1 so we know if RD goes high later on, we should increment the address. Once RD goes high, we add 1 to the output address and reset the addressIncrement variable. If we notice that WR goes low, we know that a write is being performed so we set a pin high, capture 7 bits of the data byte and set the outputData variable which is directly connected to the AVR. Later on we’ll see that the GBA software uses writes to output the key press data just like the Gameboy TX cart did. Why only 7 bits? It’s because I wanted to save $1 by downgrading to the 5M40Z, it was the only way it would fit the 40 LEs! It’s not a problem, we can just do multiple writes. We can mostly re-use the GB TX cart code so there isn’t a whole lot to change apart from just interfacing with the CPLD. I decided it may be a good idea to send one a write so that the ATtiny48 can sync up with the CPLD at the start, any other writes that may happen before the GBA program starts will be ignored. Luckily for us, the GBA doesn’t use the WR pin for any of it’s internal peripherals like the Gameboy does so we are free to do anything we like with it. After we are synced, we’ll read out 7 bits of data twice all the time as we need to send the L & R buttons – 10 bits of data, so 2 packets on the nRF24 side. I also included a GB mode which only sends out 1 packet so it can be compatible with any receivers that haven’t had a firmware update. I went with DevKitPro for developing the GBA program, it took a little while to get up and running because for some reason they took away the default Programmers Notepad that came with it years ago. Having never developed anything for the GBA, I started off with the template example. Most of the logic will be the same as the GB TX cart but there are things like the 2ms timer and how to write to the cart which need to be looked at as they will be different. Unfortunately there doesn’t seem to be that many resources out for the GBA like there is for GB but I was able to stumble upon this post about timers and after a bit of playing around, it was working. I adjusted the timer to be around 2ms by changing the REG_TM3CNT_L register and measuring the output interval with a scope when writing to the cart. "r" (address), "r" (data) : // Define the routine inputs (%0,%1,%2). For writing to the cart we’ll have to mix ASM and C so I found an example which showed this and once again a bit of playing around lead me to working code, I can write a byte to a certain address and it pulls down the WE line. When writing the key press data to the cart, we need to write to 0x8000000 which is where the cartridge access starts and as mentioned before I’m only using 7 bits out of 8 bits due to the CPLD. After each write is a small amount of time to wait so the AVR can process the request and wait for the next byte of data. And that’s pretty much it. All in all, the GBA TX cart took a lot longer than the GB TX cart did but it got me into making a GBA cart sooner than I thought and wasn’t too bad once all the problems were ironed out. 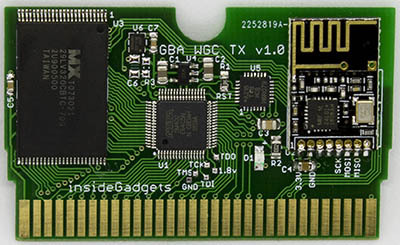 I had thought about making GBA flash carts but I think I might hold off as it may require a 4 layer PCB and there probably wouldn’t be any advantage over the clone carts. insideGadgets © 2019 All Rights Reserved. 21 queries in 0.081 seconds.